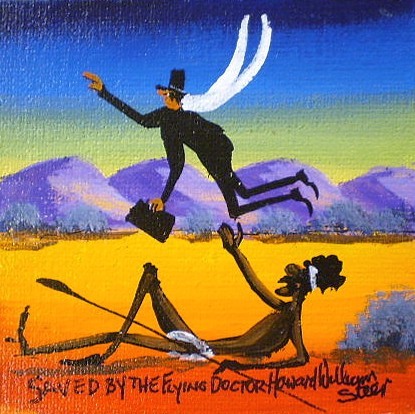 Howard Steer – Saved By The Flying Doctor. I’m going to steal Rob Messenger’s thunder a bit here. While in Charleville I found an interesting Hermes Featherlight, that had formerly been in service to a rather significant Australian. Significant enough that he features on the back of the Australian Twenty Dollar note. I speak of course, of Reverend John Flynn. Flynn wasn’t just the founder of the Royal Flying Doctor Service – which I also visited while in Charleville, but was fundamental in the four pronged approach to establishing the Australian Inland Mission (AIM) and their health & education service in the Australian outback. His decisions and actions have saved thousands of lives, and improved the lives of thousands more. Crammed and uncleaned I found this Hemes machine stuffed into a corner of an ageing wood and glass cabinet at the Charleville Museum. It was neither located with the rest of the Royal Flying Doctor artefacts, or anywhere near the three other clusters of typewriters and office machines that I had found around the museum. It sat alone, with only a hand written card – dropped almost carelessly in front of it describing what it in fact was. I was almost tempted to ask the gentleman manning the front counter if I could get my hands on it and clean it up. However the cabinet looked like it weighed about 200Kg, and was pressed against the wall so that the access doors were inaccessible. “Flynn of the Inland” is quite the outback hero. 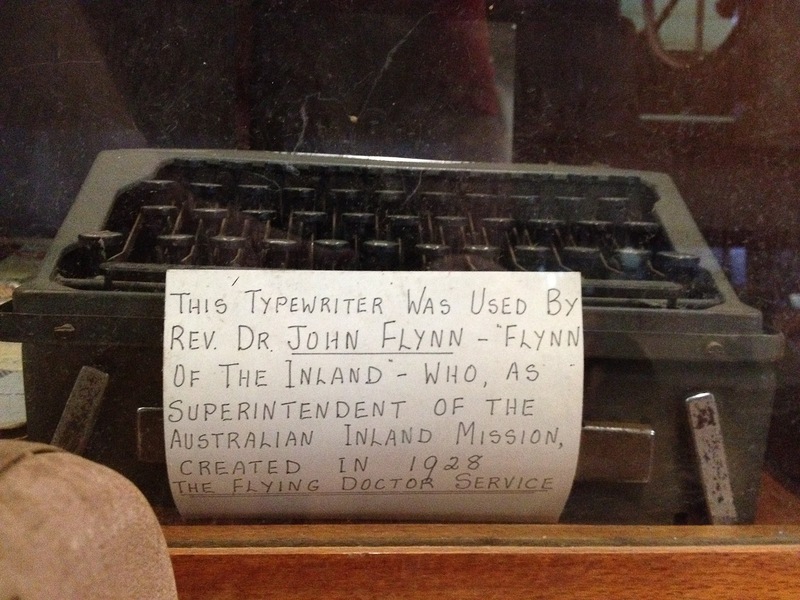 The card attached to his typewriter rather downplays his significance in Australian history. European settlement of Australia commenced in 1788. Back then, the continent was split into three regions, with no defined national borders. New South Wales had been claimed by the British, while the western 2 thirds of the continent, the coastline of which had been briefly explored by the Dutch 200 years earlier, remained under the name of ‘New Holland’. To the cold south, a piece of land was called ‘Van Diemen’s land’, and was originally thought to be a large peninsula – but turned out to be a large island. New South Wales and Van Diemen’s land originally had been established as penal colonies by the british, who for nearly a hundred years transported convicts to their shores to be put to work developing colonies and infrastructure. Suffice to say, very few of these people wanted to be here. And this included the soldiers, governors and clergymen that were sent here. Many of them were rough men either looking for adventure, or to escape precarious social circumstances that they may have found themselves in. While the governors were often brutal and corrupt, the clergymen that had been sent to Australia to protect and establish their ‘flock’ were often just as brutal. The clergymen often held other roles in early colonial society, and performed as magistrates, governors and judges themselves. While churches were being built to accommodate for the colonial christian flock, they were often built at the expense of the lives of the convicts building them. These convicts were kept in line by severe corporate and capital punishments that were often ordered at the hands of the magistrate clergymen. As such both the new settlers, and often the indigenous population living near by often suffered severely from the wrath of these often brutal men. The hypocrisy of clergymen would define Australia’s miss-trust for religion for centuries. Often when convicts had served their penal terms they fled out into the the outback and snatched up large and remote tracts of land that they used to grow cattle and sheep. The few roads and established tracks made it easy for them to distance themselves from the trauma and hurt provided by the colonies, while still allowing them an income to live out their lives alone. The colonies were still something of a backwater when the larger organised religions seemed to suddenly find an interest in attempting to establish themselves in – what was inevitably going to be a new nation. Still smarting from the slight they had copped from being essentially locked out of the American Constitution, early Australia became something of a theosophical battleground for churches as they attempted to gain influence in the newly establishing communities. Various organisations sent missionaries to the colonies, but quickly found hostility from the locals. The Australian rebellious spirit was forming, and the locals had no intention of being ruled over by bunch of men and women that had never had to live the hard lives that the former convict community had. This began to turn around slowly due to two things: The irish potato famine, and the Gold rush. Catholics from Ireland flooded into Australia to escape the oppression in Ireland, not long before people from all over the world rushed into Australia to try their luck at finding gold. All of these groups brought their religions and customs with them, changing the attitudes of the colonies to culture and religion. The subsequent cultural upheaval saw several religious groups begin to take a more serious look at what kind of role they could play in Australia. The societal push-back at these organised religions had a lot of these groups on the back foot – making it hard to dictate dogma as readily as they had in most other countries in the world. People didn’t fear the hand of god in the way they had elsewhere. Churches as such stated to become much less malign organisations, and focused heavily on improving social services. Missionaries became teachers and physicians. They slowly built up trust in colonial society by being far more socially progressive than the colonial government at the time was. A lot of these missionary groups also attempted to reach out to the aboriginals. But this had limited success, as the missionaries often saw themselves as superior people helping ‘unfortunate’ savages. And issue that came to a head with the controversy around what is now called ‘The Stolen Generation’. The colonial governments at the time considered aboriginals to be ‘part of the fauna’. Aboriginals were governed in Australia under the “Fauna and Flora act of New South Wales” until 1967. Born outside of Melbourne, and educated in various locations around the city, Flynn took on work as a teacher before becoming a presbyterian minister. In 1911 he volunteered for as a missionary in the Flinders Ranges in South Australia. Here, he discovered how difficult it was to minister to people that lived on huge tracts of land that had been allocated for use by cattle and sheep farmers. The massive cattle stations meant that a lot of people out in the outback lived further apart from each other by distances that were often larger than most countries in Europe. 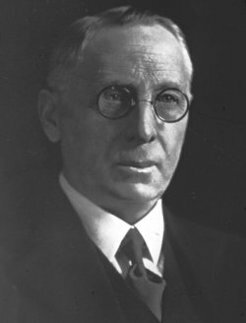 He often wrote to his superiors about the difficulties, and eventually he became the superintendent of the Australian Inland Mission. For years Flynn looked at ways of dealing with the problems that were faced by people out in these areas, and looked at the technological advances of the day. Powered flight soon gave hope to Flynn, and he started to investigate ways of using aircraft to access remote populations. But it wasn’t until Alfred Traeger built a pedal powered radio that Flynn’s vision really started to take shape. Education over the airwaves was now possible. But not only that, with the assistance of powered flight, Flynn was able to establish a means to get medical assistance to remote areas. He utilised all the technology he could, and began to construct hospitals and hostels in key locations in order to accommodate the growing needs of the region. As such, he was able to establishe the ‘Aerial Medical Service’. While it was often routine to teach aboriginal children, Flynn did something quite revolutionary at the time – he offered the same education and medical assistance services to aboriginals that he had offered the rural settlers of the region. It has, however been suggested that Flynn was personally indifferent to aboriginals, and that it wasn’t uncommon for aboriginals to be turned away from AIM hostels. However there is no written evidence to suggest this, and the AIMs policies – written by Flynn, has suggested otherwise. Flynn was very hands on with the establishment of all aspects of the AIM. He would routinely meet with architects and builders himself – and explored most of the areas where infrastructure had been built. Eventually the school of the air, and the Aerial Medical Service would be handed over to the now established Australian federal government – which had federated in 1901 to form the nation of Australia. School of the air still operates today, while the AMS is now known as the ‘Royal Flying Doctor Service’. Many of the hostels and hospitals still operate, and the Presbyterian mission has established strong communities throughout much of regional Australia. Australia is still in the top 10 important mission districts of most church organisations. I can’t say that this machine is the prettiest of the Hermes lightweight designs, but it certainly has a solid and utilitarian look about it. Doesn’t mean I wouldn’t love to own one! At a guess, this machine was chosen because it would be so easy to transport, while being so light that it didn’t add extra weight in cars or on planes, or on horses. Horseback transport was still largely common during Flynn’s era. In fact, horses are still in frequent use in rural Australia to this day. 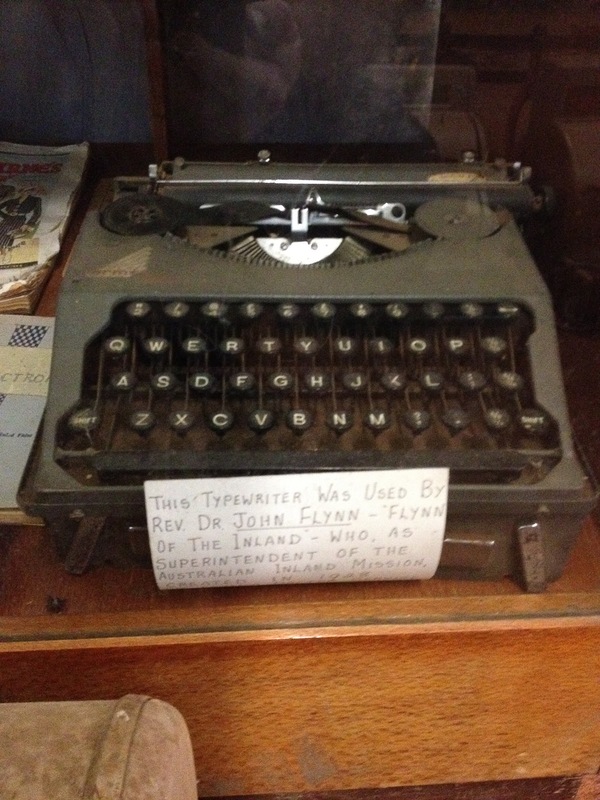 I can only imagine the correspondence that was done with this machine. Not just builders and legislators, ministers and politicians… but also the people that were most loved and cared for by Flynn. The kinds of people that almost never get mentioned in the short biographies of people that have done amazing and great things. And I would so love to have been all the places this typewriter has been – depending on how often it travelled with Flynn. There’s much that is left to the imagination with this typewriter, and have to say that I feel that it needed more than just a dodgy display card. 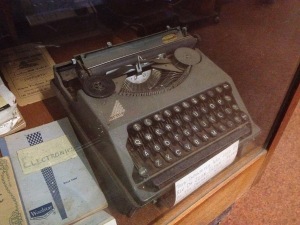 … if only it could write it’s own story. Thanks for reading this rather lengthy blog entry. Coming up next… a couple of promised photos. August 26, 2012 in aboriginal, art, Australia, colonies, doctor, health, hermes baby, hermes featherlight, history, hospital, John Flynn, Royal flying doctor service, travel, typewriter, writing. ← Typing in the museum. Let them free! Thanks for the insights into Australian history. And what a great typewriter discovery! Your trip to the outback was certainly worthwhile. Thanks for all the history. I did not know much at all about any of this except the pedal powered radio before reading your post. The typewriter discovery is especially fascinating. quite interesting! flynns's contributions were certainly important. I thought it was quite the discovery! Just felt that I needed to put it – and its user into context. Hope I did reasonable well! Yeah, this is a very potted version of events. I have tried to kind of get a sense of the scene. Definitely important in my opinion.